#corkweek – Cork Week 2014 is well underway and the management team has been making plans for Ireland's longest running and 'most prestigious' regatta. The sailing grounds in Cork Harbour and the Atlantic approaches offer a fantastic variety of sailing and that will never change. However, Anthony O'Leary, Racing Chairman for Cork Week, explains that 2014 will see some changes aimed at substantially reducing cost. Download the Notice of Race as a pdf below. "Competitors can expect a variety of courses set in open water, coastal and in the harbour, which should test the crew handling and get just about every sail out of the bag. We are blessed with some superb sailing grounds and we are intent on making full use of them. The focus for Cork Week is the same as it has always been, great sailing and a fabulous atmosphere ashore. The Royal Cork Yacht Club has never shied away from listening to sailors and, when possible, changing Cork Week to suit their needs. The resounding message from sailors in 2012 was that the racing is fantastic and the shoreside 'craic' is as good as ever but a major concern has been cost. For Cork Week 2014, the organising committee has addressed areas, that we have control of, to reduce cost for every competing yacht. For those who wish to get out on the water earlier, Monday 7th July will be a practice day. The club will organise practice starts and races that will not count towards the overall series - that way competitors that prefer a 5 day programme will not lose out. 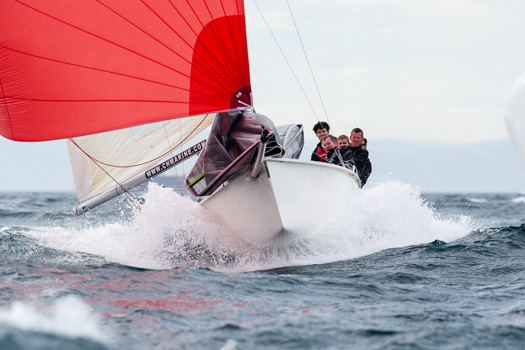 In recent years, Two-Handed racing has become increasingly popular all over the world and Cork Week will recognise this by introducing a Two-handed Class for the first time. The Sir Thomas Lipton Cup is one of the Royal Cork Yacht Club's most famous awards. The trophy, dating back to 1900, will be awarded to the best yacht in the Two-handed Class. By its very nature, sailing short handed reduces accommodation and living expenses for a competing yacht. The 1720 Class has been having a renaissance in Ireland, there are 26 1720s in Cork alone and charter opportunities are available. Cork Week is also talking with other one design classes and we would be delighted to entertain discussions with many more class associations. The management team is also keen to encourage participation by charter companies and corporate entries and plans are in place to offer assistance. In 2012, we decided to allow professional sailors to race at Cork Week in any of the classes and that will continue. We don't want to put up any barriers to people who want to come and enjoy some wonderful racing. Cork Week is striving to keep down costs for all competitors, right across the board. We realise the importance of this in the feedback we have received. However, we will make sure that the event is a memorable occasion. We want to continue to produce a unique experience and a memorable occasion for everyone that sails at Cork Week. The entry fee for Cork Week 2014 will also be reduced by 30%, compared to 2012 and the reduction in racing days and other measures will effectively reduce the overall cost of attending Cork Week by at least 20%.